FREE Truth About Weight Loss Special Report! "Top Personal Trainer and Fitness Coach Reveals Insider Secrets the Fitness and Weight Loss Industries Don't Want You To Know"
Welcome! Enter your first name and primary email address below and get instant access to the FREE Truth About Weight Loss Report and 16 Tips CD ($48 Total Value). The Five Biggest Weight Loss and Fitness Myths! Why “dieting” won't help you eliminate fat! How some supplement companies get more benefit out of their products than you do! Why doing just “cardio” can make you fatter! The REAL secret to staying committed to your training program. Why some people, even if they workout every day, still can't seem to get results. The ULTIMATE “Secret” to Successfully and Rapidly Achieving Your Weight Loss and Fitness Goals. YES! Give me the TRUTH About Weight Loss Report For Orange County Residents so I can finally discover how to REALLY lose weight once and for all! Instructions: Enter your name and primary email address below and we'll email you the TRUTH About Weight Loss Special Report Immediately! Privacy Notice: We respect your privacy. Your information will never be shared, traded or sold. Cathi Marks of Huntington Beach Lost 15 Pounds of Fat in 2 Months Using Our Fitness Boot Camp Program! Joel Turret of Huntington Beach Lost 40 lbs of Fat and Gained 10 Pounds of Muscle Using Our Personal Training Program! 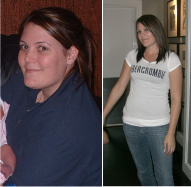 Jamie Anderson of Huntington Beach Lost 50 Pounds of Fat Using our Personal Training Program!